Welkom was host to the 6th round of the Formula Vee national championship last weekend. 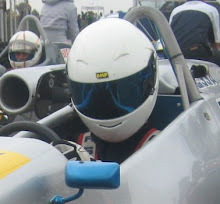 The Phakisa circuit is one of the favourites among drivers and spectators. Development driver Zaahir Essa (Reflex Solutions), one of the 2010 title contenders together with Peter Hills (Renexcon), turned out to be the centre of drama for both heats on the Saturday in his Lotto-provided Rhema 2. Struggling with a misfire, Essa still managed to qualify 4th. At the start of first heat, he came together with Symm Grobler (Auto Mecca) which consequently brought out the safety car. A lack of yellow flags and boards around the track caused the Vee drivers to not be aware of the safety car parked on the grid, and mayhem ensued. Essa had wheel-to-wheel contact with a car that veered in front of him and was launched airborne, landing hard onto the track. With an injured elbow and arm and a couple of bent pushrods on the car, he continued the race to shadow the leader Hills for every lap, only making his move on the penultimate corner of the race to claim victory. The second race turned out to be marred by safety car periods. During those couple of laps of green flag racing, however, Essa and Hills fought hard for the lead, overtaking each other in almost every corner. Eventually Essa retained the lead for the second safety car period, which lasted to the end of the race with no further racing taking place. Essa was later deemed to have overtaken Hills under yellow flag conditions and was penalised 30 seconds, pushing him to the back of the pack. The resulting penalty from the second heat puts Essa back 8 points behind Hills with 2 races to go. The next event takes place at Kyalami on the 18th of September.